Tuesday, May 8, 2018 ~ 10:00 a.m.
Visitation ~ 5:00 – 7:00 p.m.
Leonard G. Musilek, 91 of Prague, NE entered into eternal rest Thursday, May 3, 2018 at Saunders Care Center in Wahoo, NE. He was born May 23, 1926 in Prague to James and Mary (Hula) Musilek. Leonard attended St. John Elementary School and Prague High School. On February 19, 1945 Leonard entered the U.S. Navy during WWII and was honorably discharged on July 15, 1946. He was united in marriage to Bertha Nejdl on February 3, 1948 at St. John the Baptist Catholic Church in Prague. From this union four children were born, James, Connie, Gary and Larry. 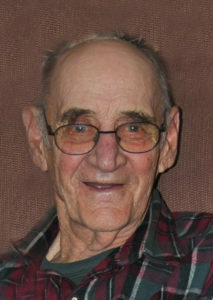 Leonard was a lifelong farmer in the Prague area. He was a member of St. John the Baptist Catholic Church, Prague Elevator Board, lifelong member of American Legion Post # 254 who received a 70 year member plaque, and one of the original members of the Rural Fire Dept. He enjoyed fishing, hunting, raising cattle, Polka music and watching Westerns. Most of all Leonard was a devoted and loving husband, father and grandfather. He was preceded in death by his parents, siblings, Marie Musilek, Irene TePoel, Georgia Shimerka, Sylvia Pabian. May he rest in peace. He lived a long and fruitful life.